Directions: North on 75. 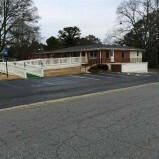 Exit Wade Green Road and Turn LT. Approx 1 mile on LT.
Summary: This is a commercial building for lease. Previous businesses include: Chiropractic Office, General Business Office, and Funeral Home. All renovations recently completed. This commercial building is much larger than it looks and features a full basement. Plenty of Parking and a Handicap Ramp. This property is situated on a corner for easy customer access. Call today for easy appointment. Descriptive Information: This 2-story free standing commercial space features a full basement, handicap access, wide hallways, Ramps to doors, stepless entry, plentiful paved parking, outside storage, and a reception area.